The Joker is a minifigure released in 2005 as a part of the Batman theme, and is Batman's arch-enemy. Joker reappeared in 2012 in the DC Comics Super Heroes theme as a minifigure and a buildable action figure in the Ultrabuild theme. He reappeared in 2013 in an Arkham Asylum inmate outfit. He appeared in 2014 in a new suit in the set, 76013 Batman: The Joker Steam Roller and a figure based on his appearance in The Dark Knight in 76023 The Tumbler. The first variation of The Joker was officially released in 2006, but could be secured in 2005 with the Commemorative Limited Edition Batman Announcement. This variation of The Joker was how he appeared up until the Batman line's retirement in 2008. 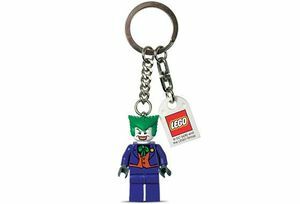 Joker's first variation was the first, and currently only, minifigure to use the Vampire's hair-piece in the dark green colour. The Joker's head is single-sided and features a large, evil smile, with green eyebrows, two black eyes, red lips, and browned teeth as well as several black lines to give his face more shape. The Joker's torso has an exclusive print to show his classic purple suit. Also on the torso, is a green bow-tie, an orange undercoat, and an acid-spitting flower, which is represented by a Yellow dot. Rather than purple or white hands, The Joker uses Dark Stone Grey hands. The Joker's legs are purple and left unprinted. 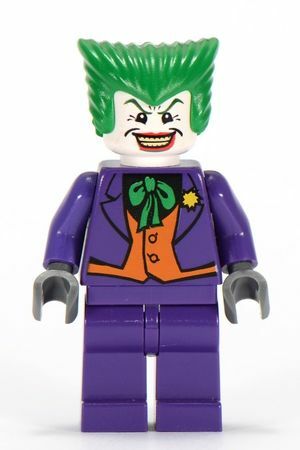 LEGO designers have stated that they designed this version of The Joker to look like Mark Hamill's representation of the character, as seen on the popular television program from the nineties, Batman: The Animated Series. In 2012, with the relaunch of the Batman theme as part of Super Heroes, The Joker is redesigned with the newer hairpiece introduced on Count Dooku, white hands, and printings which give him his appearance in some DC Universe comic books. Joker's hair piece is Dark Green, swept back, and has a widow's peak. The torso and hands are also different. The hands are now a white just like his face, which is also redesigned with a newer evil smile with a mouth full of Yellowing teeth, grey lines to give his face more shape, and an overall more gruesome appearance. Joker's torso still has his signature purple jacket and green bow tie (but now the bow-tie is Earth Green, rather than Dark Green), but his vest is now green (rather than orange) with a checkered print, yellow buttons, and the shirt underneath his vest is yellow rather than black. However, the biggest torso redesign may be the acid-spitting flower which has been expanded to a noticeable view rather than the little yellow flower that looks like a spot on the original Joker's coat. The torso has also been updated with back printing and a double-sided head. This variation much is based on the variant of Joker from the comics. Joker has the same hair piece and head as the suit variant, but with a new suit. He has an orange torso printed with some of his white skin, and a loose grey shirt with an orange inmate jacket and a brown belt with a grey lock on it over it. His back printing shows the outline of the uniform, the back of the belt, the creases in it and "Inmate 109370". His arms are orange and his hands are white. His legs are orange and unprinted. This variant came with a purple fedora. He has a new slightly different face, the differences being his eyes are bent in an angry expression and his mouth is slightly turned into a cunning grin. He has a purple torso with white hands, and is printed with a purple suit with light purple flaps and pocket liners, a light blue plaid vest, and orange buttoned up shirt, and a green bowtie. The back features creases of the jacket. He has purple unprinted legs. A microfigure of him was to be included in 50003 Batman, before the LEGO Games line was canceled. He is purple and is printed with the standard variant that is smiling. This version has Anakin Skywalker's hair in a bright green. The flesh head has white face paint that is haphazardly put on, with black around the eyes, and uneven red paint on the lips which forms a smile which also covers the scars branching of the main smile, though he has a serious expression, and facial creases that aren't covered by the paint. There is a second face where he is smiling showing his yellow teeth. The torso is once again purple, but it has dark blue hands. The torso is printed with the jacket with flaps, buttons on the left and a pocket on the upper left; a light blue dress undershirt, a medium green waistcoat, a patterned light blue dress shirt and a dark and light green checkered tie. The purple legs continue the trench coat from the top, and silver chain on the right side. The back features crease on the jacket. This DUPLO figure is more child like than previous reincarnations. The Joker has short flat green hair. Joker's torso still has his signature jacket and a bow tie, this time in orange. He has black eyes. He wears red face paint around his open smile mouth. Beside his bowtie is his yellow acid flower. His vest is now dark green and has big yellow buttons. Jokers arms are purple, his hands are white, and his legs are green. Joker has appeared as a keychain once in 2007 and as a "Bonus Keyring" in KC7782 The Batwing with Joker Key Chain. As a keychain, Joker is identical to his original variation, but his parts may not be removed as a normal minifigure's can. He also has a silver chain attached to the top of his head, which in turn attaches to a silver ring, which has another shorter chain attached to that which holds a plate that reads LEGO. Joker appeared as a magnetic minifigure along with Robin and Catwoman in 851689 Catwoman Minifigure Magnet Set and 4493781 Catwoman Magnet Set. Like the Joker Keychain, this variation of Joker resembled his original variation. However, two black magnets are stuck inside of his legs and his torso is unable to detach from his hips. His head and hair are just as easy to remove as most other minifigures' would. In 853431 Batman, Robin, The Joker Magnet Set, Joker reappears as a magnet with his 2012 variation. His legs are permanently attached to the grey, magnetic base and his torso to his hips. In 2008, this version of Joker was released with some McDonald's Happy Meals to promote the release of LEGO Batman: The Videogame. It is similar to his original variation but much larger than a normal minifigure, is unable to be taken apart, and posed in ways most minifigures would be unable to. As a McDonald's toy, Joker's hands are raised in the air, one leg is pointed to the side, the other leg is in a position as if he has just stepped forward, and his face is staring forward. 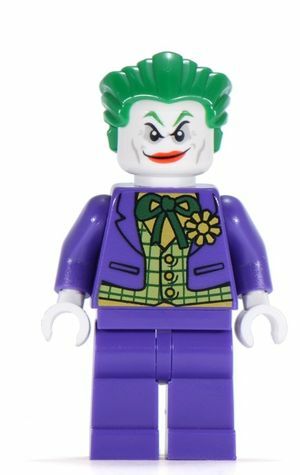 Joker's hair design, colours, and prints are all the same as his original minifigure. 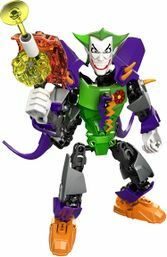 In 2012, Joker appears as an Ultrabuild figure. This version is similar in design to recent Hero Factory sets. Here, The Joker wears an assortment of various different colours, such as; Purple, Orange, White, Green, Metallic Dark Grey, and Black for most joint pieces. Joker's chestplate is green with a lightning bolt piece, which is orange on one side and purple on the other, for a tie and printing depicting a red flower with a yellow center on his chest. His upper arms are coloured metallic dark grey with and both have a small orange spike attached the front. Joker's lower arm is purple and without spikes. His hands are coloured white. Joker's legs mirror his arms with metallic dark grey on the upper part and purple on the lower, but they are without spikes and end at orange feet. On his shoulders, Joker has two purple flaps facing upwards with two orange spikes. There are two spikes attached to Joker's back which are long, curved, and purple to represent coat tails. Joker's head is thin and white with black eyes and eybrows. His mouth is white with a large, red lower lip. Joker's hair juts out to the left, right, and behind. His hair has a dorsel shape in the center of the top. This head is similar to his appearance in various cartoons. Joker is also armed with a ray gun coloured Transparent Bright Orange, White, and Transparent Yellow. Joker can be combined with 4528 Green Lantern to create either a larger version of The Joker, or a a larger version of Green Lantern, or with both Green Lantern and Batman to create Lantern. There are two variations of The Joker in LEGO Batman: The Videogame. The Joker has the ability to walk through toxic waste unharmed and activate special generators. He is armed with two machine guns, a deadly joy-buzzer, and in the DS game, Razor Bladed playing cards. His first variation is identical to his appearances in 7782 The Batwing: The Joker's Aerial Assault and all others up until 2008. His second variation has a purple sun hat, the same face as the original Joker variation, a striped, green tourist styled torso, purple legs, and purple hands. This version of The Joker may be unlocked in "Villain Hunt" on the final level on DS games and is unlocked for purchase after the level "Dying of Laughter" is completed on consoles. It is a reference to The Killing Joke by Alan Moore and Brian Bolland, where The Joker wears a similar outfit when he visits the Gordon household and shoots Barbara Gordon (Batgirl) in the spine. It should be noted that this event never seems to have occurred in LEGO's Batman continuity, as Barbara's career as Batgirl has not yet ended, while events taking place after The Killing Joke, such as or based on No Man's Land and Knightfall, have taken place, according to the Batcomputer in LEGO Batman: The Videogame. 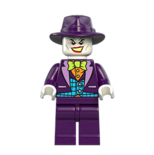 The Joker's tropical variant is also an unlockable character in the portable versions of LEGO Batman 2: DC Super Heroes. He has a redesigned appearance, and his minikit can be found in the level Wayne Manor. His face now resembles the Super Heroes variation and his torso is similar, but the dark blue is lightened and the palm trees are red, and a few other small changes. He wears a purple fedora instead of a sunhat, and his arms are white instead of green. In LEGO Batman 2: DC Super Heroes, Joker is identical to his appearance in 6857 The Dynamic Duo Funhouse Escape and 6863 Batwing Battle. He is still able to activate electrical power-ups with his joy-buzzer and is immune to toxins. He is armed with a machine gun. Joker is unique among other major characters in the Batman franchise in that he has no official origins in the DC Universe. 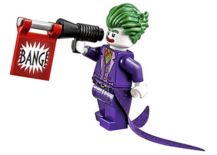 According to LEGO Batman: The Videogame and LEGO.com, Joker's orgin in the LEGO Batman continuity is the one most accepted by fans; Joker was once a small time criminal, known as The Red Hood, who was trying to escape Batman. The Red Hood fell into a vat of toxins which turned his hair green, bleached his skin white, stained his lips red, and stretched them out into an everlasting smile; it gave him the appearance of a crazed clown. The Red Hood was driven insane by this reflection, and renamed himself The Joker. However, according to the January/February 2012 issue of LEGO Magazine, Joker has told his origins in so many different ways, that nobody knows for sure, possibly not even Joker himself. Both origins agree that Joker became Gotham's most sadistic and twisted crime boss and that he is insane, but also a genius, having knowledge of chemistry, physics, and engineering; Joker invents gag-based gadgetry whilst concocting criminal schemes. The Joker also cheats death frequently, having been thought killed several times only to come back and wreak havoc once more. He has many minions serving under him, most notably his self-proclaimed lover, Harley Quinn, who herself was once his psychiatrist at the Arkham Asylum, and fell in love with him there. The Joker is a mass murderer and has been known to kill many people, even his own henchmen. 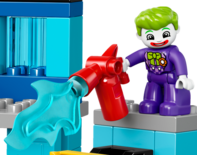 Joker is widely accepted to be Batman's arch-enemy, which he is noted to be in the January/February 2012 issue of LEGO Magazine. Some of his most notable crimes were when he shot Barbara Gordon and paralyzed her, and when he seemingly murdered Jason Todd. The Ultrabuild Joker created a machine that allowed him to absorb the forms of Batman and Green Lantern into himself, creating Lantern. In LEGO Batman: The Videogame, The Joker was a boss on the level To The Top of the Tower. The Joker is a playable character in every ground villain level in Return of the Joker and unlocked after the first level A Surprise for the Commissioner is complete. In the video game's story, The Joker led a group, which consisted of Harley Quinn, Killer Moth, The Mad Hatter, and The Scarecrow. In the video game's prologue, Joker is seen inside Arkham Asylum along with Penguin and Riddler. They nod at each other and a prison break begins. During the break, Joker knocks one of his goons out of his helicopter and escapes on it along with Harley Quinn, Killer Moth, Mad Hatter, and The Scarecrow. Joker is next seen wreaking havoc on the streets of Gotham by attacking a Police Officer and taunting Commissioner Gordon on the officer's walkie-talkie. After a briefing session with the rest of his group, the Joker sent the Mad Hatter to retrieve some chemicals from the factory which let to his transformation, while he and Harley lured Commissioner Gordon to an old fairground where they captured him. When Batman arrived to rescue Gordon, the Joker ordered Harley to attack Batman while he made his escape. After she was defeated, Harley was placed in a police van. The Scarecrow and the Joker created trouble in the sky to lure Batman and "Send him tumbling to the ground." This backfired when the Scarecrow's Bi-plane was shot down, by Batman and Robin, and crashed into the Joker's helicopter, destroying both. Both villains were left for dead by Batman, but survived by using oversized balloons. The Scarecrow and the Joker crashed through the roof of the Gotham Art Gallery. To make their escape, they made their way to the storage area in the back of the gallery, where they were ambushed by Police Officers. The Joker escaped by using his laughing gas, but the Scarecrow was grabbed with a crane and sent him back to Arkham Asylum. Killer Moth assisted the Joker in reaching the Gotham City Cathedral and freeing Harley Quinn from Commissioner Gordon and the Police Officers. once Harley Quinn was freed, Commissioner Gordon contacted Batman and informed him of the attack. Killer Moth was attracted to the floodlight on the Batwing which Batman arrived in. Batman and Robin gave chase to Killer Moth, and eventually they cornered and defeated him, sending him back to Arkham Asylum. When The Dynamic Duo and Police Officers arrived at the Cathedral, Robin opened a window to gain entry. Harley jumped out, knocking off several Henchmen. Harley was defeated with large water guns on the back of police vans. Batman and Robin chased Harley to the top of the Cathedral where she and the Joker hid in giant bells. Once they were discovered by Batman, The Joker summoned his helicopter for protection, but once the helicopter was destroyed, it collapsed the platform which the Joker and Harley were on, knocking Harley unconscious. The Joker then attacked the Dynamic Duo, successfully defeating them with his joy-buzzer, knocking them unconscious. Harley was revived by the time Batman was. Batman threw a batarang at the giant bells which disturbed the bats in the tower who attacked Joker and Harley. They were then arrested by Commissioner Gordon and sent back to Arkham Asylum. Batman and Robin scale the side of Arkham Asylum with their Grapple-Guns. The Joker looks up out of the window in his cell and begins to swing his fist in anger. 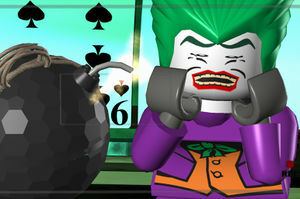 The Joker is in LEGO Batman 2: DC Super Heroes as a playable character and one of the main antagonists. In the beginning of the game, the Joker, Harley Quinn, Two-Face, the Penguin, and the Riddler raid the Man-of-the-Year award ceremony, and aside from stealing from the guests, such as Lex Luthor, the Joker also steals Bruce Wayne's award trophy. During his "acceptance speech" the Dynamic Duo in the Bat-Boat crash through the stage behind him. The Joker, Two-Face, the Penguin, and the Riddler escape through the stage's trapdoor while Harley defends them. However, she was defeated and Batman and Robin defeated each of the other villains one by one. The Joker was able to escape the theatre, however, and made it to his boat. He was chased by Batman in the Batwing and Robin in his helicopter. Batman and Robin chased him through to the Amusement Mile, where Batman disrupted the water with the Batwing's wing and caused the Joker's boat to go ashore. After several failed attempts to defeat Batman, the Joker targeted the Batwing and was caught in a bat shaped net and sent to Arkham Asylum. In his cell, he became angry at Clark Kent for coming all the way to Gotham to report on his defeat. Lex Luthor had gained an admiration for the Clown Prince of Crime at the awards ceremony using the Deconstructor, which is capable of destroying shiny black objects. Demonstrating his weapon, Luthor then used it to free the Penguin. They form an alliance and make a deal; if the Joker can get Luthor a new source of kryptonite and give him a supply of laughing gas, then he will have free use of the Deconstructor. Luthor then hints at using it on Batman's vehicles. While leaving the Asylum, the Joker aimed the Deconstructor at several "shiny black" walls and freed Catwoman, Two-Face, the Riddler, Harley Quinn, Poison Ivy, and Bane. The Joker robs Ace Chemicals and creates false kryptonite. When Batman and Robin take it, he and Luthor use the tracking device in it to find the Batcave, destroy Batman's vehicles, and take the kryptonite Batman keeps in a vault. They leave for LexCorp in a large aircraft with the kryptonite. Batman and Superman infiltrate the aircraft, but Batman is dropped through a trapdoor and while Superman saves him, the aircraft escapes. At LexCorp, they finish construction of a large Joker-robot and blast through the roof on their way back to Gotham. Batman and Superman try to stop the robot, but Superman is weakened by kryptonite and Batman saves him. The robot lands back in Gotham and is approached by Batman and a weakened Superman. Lex and Joker force them into the Metro. After several attempts to stop them, Batman and Superman escape. Luthor gives a speech at the City Hall while the Joker sprays a mind altering gas. Once again, Batman and Superman arrive to stop them. The latter uses his heat vision to destroy the robot's flower that is distributing the gas. Robin arrives in a multi-colored Batmobile. The Joker and Luthor chase him and Batman through the city while they leave a Kryptonite trail which resembles the Joker's face. They then decide to attack Wayne Tower. However, Martian Manhunter saw the Kryptonite trail from space and alerted the rest of the Justice League. While Superman and Wonder Woman keep the building standing, Batman, Robin, Green Lantern, and Cyborg fight the robot and drive it into the ground. Green Lantern created constructs to keep the building standing, which freed up Wonder Woman and she and the Flash joined the others to finish the robot off. The Joker emerges and tries to use his joybuzzer to defeat the Justice League, but was defeated, and Luthor soon afterward. The Joker appears in the hub at Ace Chemicals. To reveal him, the Flash needs to rebuild the Batcomputer Remote Terminal before he can be subdued and purchased for 250,000 studs. The Joker was voiced by Mark Hamill in Batman: The Animated Series, the television series which his first variation is based on. Mark Hamill also played Luke Skywalker in the Star Wars trilogy and voiced Von Nebula in the Hero Factory TV series. In the news report cutscene before the level Destination Metropolis, the text at the bottom said that he's been in Arkham Asylum the record amount 280 times and escaped 281 times. The Joker's Tropical outfit is based off of his appearance in Batman: the Killing Joke. This is a description taken from LEGO.com. Please do not modify it. Joker The Joker(). Cool Fact: No one is really sure how The Joker became The Joker, and over the years()knows! This page was last edited on 13 January 2018, at 04:09.